Wendy’s primary passion for 40 years has been organic farming and gardening. Her training started with a 1-year apprenticeship at the UC Santa Cruz Farm and Garden in 1976. For 10 years she managed the variety trials and demonstration gardens for Shepherd’s Garden Seeds and was the lead garden advisor for customers nationwide. She worked with many farming and gardening professionals around California as well as in fine restaurants, where she produced herbs, edible flowers, and vegetables directly for their use. Wendy has been actively involved with organizations working to further a more sustainable agriculture and was a farmers market manager for 10 years. For 7 years she coordinated the 4-acre garden at Santa Rosa Jr. College’s Shone Farm, which is part of the Sustainable Agriculture program. It includes production market vegetables, orchards and berries, cut flower production, perennials and herbs. She is currently Adjunct Faculty with this program. Wendy has also been teaching Master Gardener classes since around 1992, teaches workshops on edible gardening through Santa Rosa Parks & Recreation Department, and assists home garden clients. Growing up in a yard full of wild and wooly plants got the dirt into Sara’s blood and love of plants into her heart. After finishing college studying political theory she decided to get grounded in more real things by working on a farm in Santa Cruz. Four years of harvesting lettuce and weeding long rows got her thinking about the beauty of the garden. She moved to Mendocino County and spent the next 7 years running an educational garden at Shenoa Retreat Center. From there she moved to Emerald Earth, an intentional community in the hills above Boonville. There she mixed permaculture and intensive food production to grow food for the community. She has worked closely with many chefs and specializes in gardens that are connected to a kitchen. For three years she ran the gardens at the Boonville Hotel and currently she works at Lynmar Estate, a winery in Sebastopol. 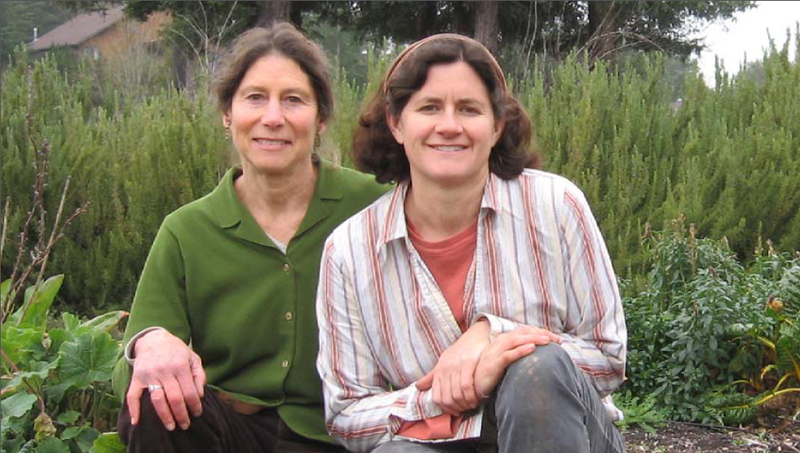 She hosted a farming and gardening radio show on Mendocino Public Radio for over 8 years. Most of her gardening has been in public, educational food gardens. Strongly committed to the Local Food Movement, she has actively worked with many organizations promoting good food and farming. She helped start the West County Community Seed Bank in Sebastopol, CA, one of the earliest seed libraries and seed gardens in the country. She is currently the Garden Manager at the Ceres Community Project.